Click above to view the Microwarriors Special Edition trailer. 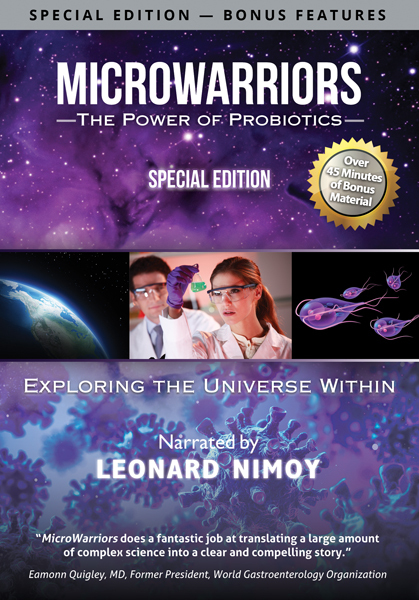 In this groundbreaking film, Microwarriors: The Power of Probiotics—Special Edition Narrated by Leonard Nimoy, you’ll be taken “inside the world” of these beneficial bacteria. You’ll learn everything about probiotics, from their discovery in the early 20th century to how they’re tested and produced—plus the latest scientific research from some of the top probiotic experts in the world. You’ll find the answers to many of your questions on probiotics in this landmark documentary. Microwarriors is the most comprehensive, complete, and up-to-date film ever produced on probiotics and their contribution to overall health and well-being. • Probiotics and Your Pet’s Health: This segment will explain why probiotics are vital to your pet’s health. • Probiotics and Your Children’s Health: This segment will provide important information on how children may benefit from taking probiotics. • Probiotics and the World of the Microbiome: In this special 25-minute segment, two leading scientists will provide the latest information and research on the importance of the trillions of microorganisms that live inside the human body, collectively referred to as the Microbiome. Health Point Productions is a Los Angeles-based company designed to produce, market, and sell quality documentaries to specialized health markets. Health Point Productions’ films sell to the DVD trade as well as to a large variety of non-traditional outlets. The staff at Health Point Productions is composed of talented and experienced film-making professionals. Our script personnel develop and edit movie scripts designed to meet the needs of specific audiences; our production staff produce documentaries primed for market attention; and our marketing and sales people provide effective distribution, promotion, and continuing sales. Health Point Productions provides each department with instant access to important information and resources that enables each staff member to communicate quickly with others—all with the goal of creating the best products possible. Our doctors and speakers include individuals and organizations that are considered leaders in their respective fields. At Health Point Productions, we believe that educating both consumers and health-care professionals is of critical importance in today’s increasingly complicated health-care environment.